A further sign of the Atlanta Hawks’ declining basketball manufacturing economy is the transition of Philips Arena from the Human Highlight Factory to the Human Humiliation Factory. Rather than covet the paying customers, fans who attend games for their floundering team, Atlanta chooses to lampoon them for halftime entertainment. “The Freeze” clowns fans at Braves games by leaving them in his dust or worse between innings. It’s only a matter of time until the Atlanta Falcons get on board by having fans rush Michael Vick in the pocket during timeouts. This season, the Hawks have turned to And1 Mixtape Tour legendary ball handler Hot Sauce as their halftime torturer. For 24 seconds, one (un)lucky fan in attendance has to defend Hot Sauce or swipe the rock for the chance to win a measly prize. Of course, the point isn’t to award loyal fans, it’s to give everyone else in attendance something else to point and laugh at besides the Hawks’ 15-35 record. Already this season, Hot Sauce has bounced a ball off a fan’s face and basically ravaged the self-esteem of every fan called out there. It would be an understatement to say he was a tad bit overconfident though. In case you thought this was the underdog story of a surprisingly gifted fan shocking the world and showing off his skills, you’re mistaken. After Hot Sauce toyed with the fan for a few seconds, he crumpled up like a dollar bill and earned internet infamy. 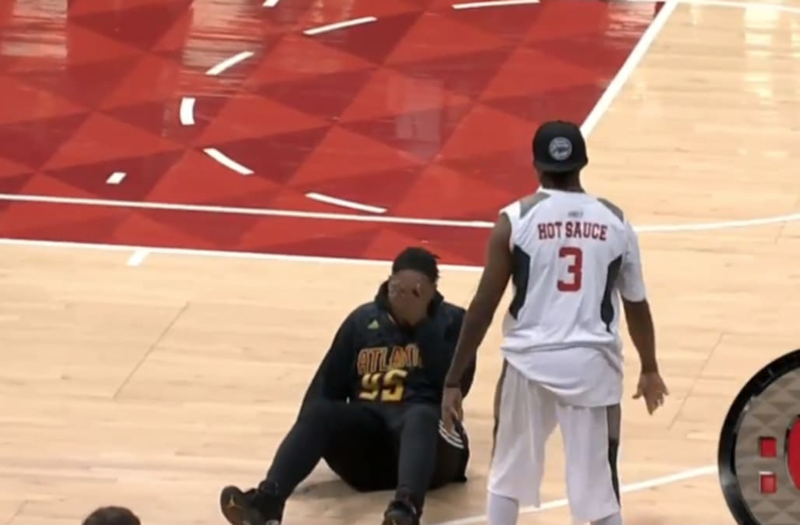 This Hawks fan thought he could guard Hot Sauce. In his defense, he never said he was good at playing defense.